Yep, it's that time of the week again - Time for football food, coolers full of cold ones, and game day buffets. Bring over your chips and dips, chili and chowders, all your wings and party things! It is week #12 and is is getting exciting yet? Again thank you all so much for joining in each week! 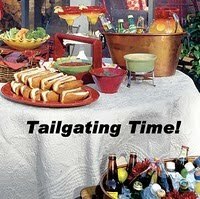 !, if you are new to us or a Tailgating Time time regular! Come on! it's easy, just add your link! Sorry I got the link up so late...I was looking for it to add to my post before we left to take Maranda and her friends on the boat for her birthday. It was another gorgeous day. We saw a dolphin right next to the boat, had some lunch and are back now ready for a nap! Lyndz, glad that you made it before going for the boat ride. Hope you're having a wonderful time & Happy Birthday to Maranda. Have fun! Hi Lindsey, This sounds so fun. Can I submit mine? Any dish or dessert will do? What a beautiful selection, I just want to dive into all that delicious food! Kristy - You know it! Thanks I'll be sure to tell her. HH - Isn't it fun to check all the great recipes out like this? Thanks I'll be sure to let Maranda know!! Thanks for hosting Lyndsey. My girls dream of seeing a dolphin up close...amazing! Did you get some pictures? Thats a lovely collection of recipes! Rhondi, I'll have to post the dolphin picture next time! Rachana, everyone is always so creative here!